A Rainy Day - Super Inky! This winter in New York, the weather has been very mild. We've only had snow twice- once on the day before Halloween and once while Piper and I were in Washington DC. What we have had are lots of cool, rainy days. A few weeks ago, a new girl came to my apartment building. Her name is Alaina and she's German! She was born American, but a German couple adopted her when she was a baby. She has an open adoption, so she had come back to the US to visit her birthparents. 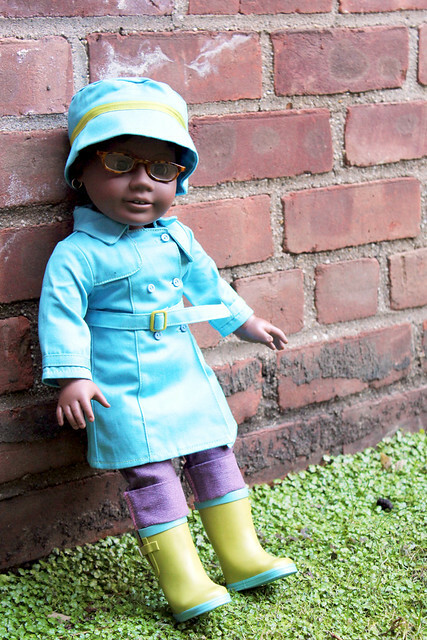 Our parents are friends, so even though she'd never met me, she brought a gift- new rainboots! They're teal green with white tops and I love them! Alaina taught me to say rainboots in German- Gummistiefel! Anyway, last week it rained and left lots of puddles, so Piper, Alaina, and I put on our rainboots and stomped through the puddles in the courtyard. Alaina told us that it rains a lot in Germany. Neither Piper nor I have been there, so we love hearing Alaina's stories. She brought little packets of Haribo gummy bears. She calls them Gummibären. My favorites were the clear ones, which are pineapple flavored. Piper and I wore our sweaters outside. We tried to match our boots to our outfits- how did we do? We walked around the courtyard very nicely. There is a sign on the lawn that says "No Children or Dogs on Grass!" I really wish we could play on it. There is a playground in our neighborhood, but it is a few blocks away, so we can't go without a parent. Do you have a playground in your neighborhood? A few minutes before we were going to go back into the building, it started raining again! Alaina and I ran to the vestibule of our building, but Piper was thrilled to use my new umbrella. 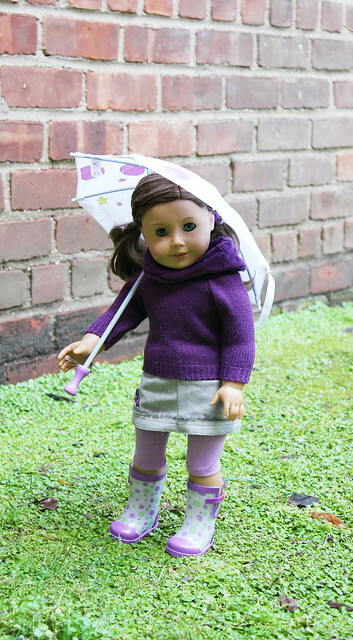 She happily stomped around in the puddles while Alaina and I waved to her from the vestibule. After a while, it started pouring, so Pipes came inside. We spent the rest of the afternoon playing Connect Four in my room. 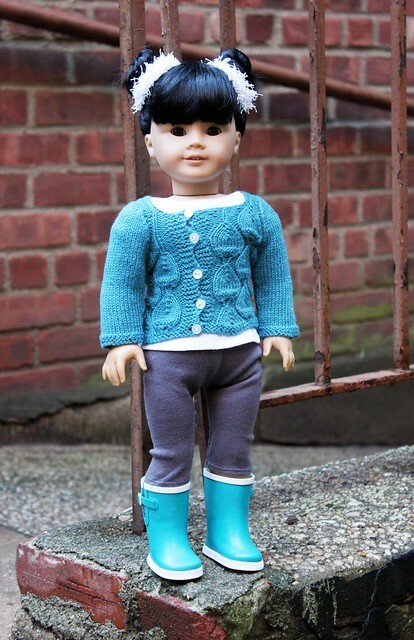 You and Piper look wonderful in your sweaters and rainboots. Ah, I love the rain! I am so used to rain, being from Lille and all. At first, I did not miss it. As my days in the States progressed, I realized how much I actually loved the rain. During rainy days, I like to cuddle up in a blanket and watch my favorite movies. The German words in this post make me miss the German classes I was in when I was in France. It was such a fun, yet challenging, language to learn. I'm adjusting to my Spanish courses, but I would still love to improve my German someday. I love summer rain when it is warm enough to go out and twist and turn in the drops with your face up getting splashed on. It is sooooo fun. I also love to splash in puddles and skip rocks on the big ones. It would be fun to know someone from Germany, I cannot wait to go on the cruise to the Caribbean, Marsali says we get to visit several islands under different country rule and it sounds like so much fun. Specially St. Marteen, it has Dutch on one side and French on the other .. sounds awesome visit many countries in one week. Marsali has been so many places to get kewl stamps on her passports. It's been raining alot here too Inky. When it rains, I like to curl up on my bed and read. I finished a book in one week thanks to the rain.